CHAMPAIGN, Ill. – A career-high 23 points from freshman guard Jarrod West was not enough for the Marshall men’s basketball team to overcome Illinois, as it lost, 91-74, on Sunday night at the State Farm Center. With the loss, Marshall fell to 2-2, while Illinois rose to 4-0. West’s 23 points came from a near-perfect 7-of-8 (87.5 percent) from field goals, 5-of-6 (83.3 percent) from 3-pointers and 4-of-6 (66.7 percent) from the free throw line. Junior forward Ajdin Penava earned his second consecutive double-double from 15 points and 11 rebounds, while junior guard Jon Elmore added 14 points. Five different members of the Fighting Illini reached double figures in points. Both Leron Black and Kipper Nichols had 17 points for Illinois. After jumping to an early 7-3 lead thanks to layups by senior forward Milan Mijovic and a combination of junior guard C.J. Burks and West 3-pointers at the 17:53 mark. From there, both sides traded baskets until the score was tied at 18-18 with 11:24 to go. The Illini then went on a 10-2 run in the next four minutes to make the score 28-20 at the 7:09 point of action. The Herd battled back thanks to efforts of West’s five points and Elmore’s eight points to cut the Illinois’ lead to three with 3:54 to play. The Fighting Illini countered with a run of its own and made the score 46-36 at halftime. After the second half began, Illinois began with a 10-4 run with 16:35 to go. The gap was too much for the Herd to catch up to for the rest of the game, and it fell, 91-74. Jon Elmore has now reached double figure scoring in 39 consecutive games. It was the first time this season Jon Elmore did not reach at least 20 points and missed more than one free through in a single game. Ajdin Penava picked up is fifth career double-double and second straight double-double. West’s five 3-pointers were career-highs. Marshall is now 2-1 when it connects on at least 10 3-pointers. 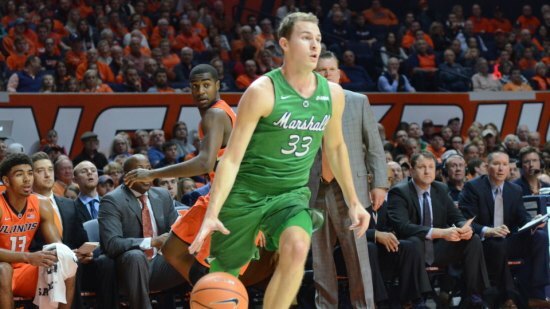 Marshall allowed five opposing players to reach double figure scoring in the second straight contest. Ajdin Penava has now made at least two 3-pointers in every game this season. Marshall will return home to the Henderson Center to take on N.C. Central on Wednesday, Nov. 22, at 8 p.m.